Yesterday, Secretary of State Amber Rudd announced that there would be no further public funding to the Green Deal Finance Company, the Government would stop any future funding releases of the Green Deal Home Improvement Fund (GDHIF) and wanted to work with the industry and consumer groups on a new value-for-money approach. Whilst it was widely recognised that the Green Deal and GDHIF could be improved upon, to put an end to both of them so abruptly without any warning or anything to replace them is a major issue and concern for both householders and the supply chain and will only add to the current hiatus in the energy efficiency market. Recent figures published by DECC and Ofgem on the Energy Company Obligation showed that the energy companies have already made significant progress towards their targets for ECO2 (April 2015 - end March 2017) and that based on the installation rates in 2014/15 the target could be achieved one year early in Q1 2016. This is reflected in the major slowdown in ECO activity where just 29,000 measures were installed in April 2015, a 2 year low and compares to 51,000 measures in March 2015 and 58,000 in April 2014. The Green Deal and GDHIF provided an important means of supplementing ECO activity so their removal is a major blow for both householders and industry - working to build on these frameworks rather than pulling the rug from under them would have been the best approach. DECC are aiming to develop and establish a more stable, long-term, coherent framework for home energy efficiency, we welcome Amber Rudd’s announcement that she wants to work with industry in doing this and we look forward to contributing towards it. However, the decision to pull Green Deal and GDHIF without first developing alternatives will seriously undermine consumer confidence and also the confidence of industry and its ability and willingness to support whatever replacement framework is developed. Therefore we would urge the Secretary of State to set out a clear timeline for the delivery of the proposed new framework as soon as possible to provide much needed clarity for consumers and the industry, whilst putting in place an urgent transitional mechanism to fill the void left by Green Deal and GDHIF and help address the current hiatus whilst the new framework is developed. "Energy efficiency is the most effective way to reduce carbon and reduce bills - it is the win-win"
Commenting on yesterday's statements from the Secretary of State, our CEO Neil Marshall said “We welcome the recognition of the importance of energy efficiency along with the level of ambition and intent and look forward to working with Ministers and officials in turning this into the delivery of hard measures on the ground. With around 6m cavity walls, 7m solid walls and 7m lofts in existing homes still lacking adequate insulation, it is crucial that a long term plan is developed which will ensure that these homes are insulated in a timely, systematic and cost effective manner. Next week we are meeting with DECC Ministers and look forward to kick starting this process. - A consumer awareness and engagement programme with Government backing to clearly spell out the benefits of insulation. - Targeted incentives and regulations where they are needed and can be justified as a means of pump priming the market. - The increased role that area based delivery can play in achieving more cost effective delivery on the ground and engaging whole communities in energy efficiency upgrades. - A more attractive ‘Pay as you Save’ proposition that reflects the way that consumers purchase and pay for other items with greater flexibility and choice in interest rates and payback periods. - A more effective and efficient means of identifying and targeting fuel poor households with a package of appropriate measures delivered that will ‘fuel poverty proof’ the property. Calling on Government to make Energy Efficiency Retrofit of the UK Housing Stock a National Infrastructure Priority supported by appropriate levels of capital expenditure and a long term delivery plan. Seeking early decisions from Government Ministers on the future of the Energy Company Obligation after the current obligation ends in April 2017 and a longer term ECO, preferably five years. Working with DECC, Ofgem and Energy Companies to review and revise the compliance requirements for ECO in order to simplify these and reduce compliance costs for future schemes. Seeking urgent clarification from Government Ministers on their future intentions for the Green Deal Home Improvement Fund and Green Deal Communities scheme as well as putting forward proposals to make these or alternatives even more effective. Submitting proposals on changes that could be made to the Green Deal to make it simpler and more attractive to householders. Contributing to the Chief Construction Advisers current review of the Solid Wall Insulation (SWI) market including recommendation on how to most effectively tackle the 7m homes that still require SWI. Whilst this work in influencing Government policy and programmes is extremely important in securing a long term sustainable future for the industry, we are also committed to helping our member’s access additional business opportunities outside of the ECO and Green Deal right now. Launching a new consumer website www.nia-uk.org/consumer with an installer postcode locator which is receiving around 50,000 searches a year and providing free leads and referrals to our members. Working with leading consumer groups including the Energy Saving Trust and Money Saving Expert to promote the benefits of insulation and referring householders to our members. Creating new business opportunities in the new build and commercial markets by providing our members with market intelligence and information and promoting insulation to key specifiers in these sectors. 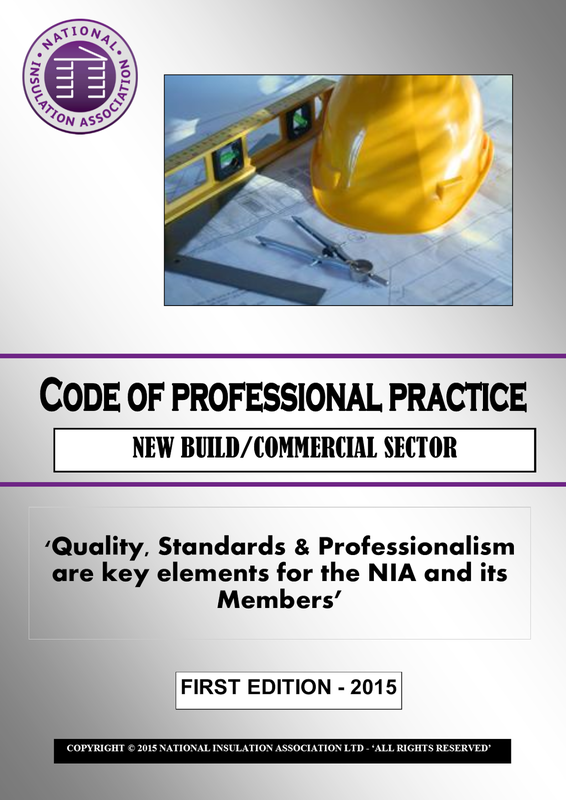 In addition we introduced a new Code of Professional Practice for NIA members operating in the New Build and Commercial markets to differentiate them and provide competitive advantage vs. non NIA members. Introduced a new free service for Local Authorities, Housing Associatons and Procurement Framework Operators to access and specify our members via expressions of interest and tender requests. The NIA is the leading trade association for insulation in the UK and represents the manufacturers, system suppliers and installers of cavity wall, external wall, internal wall, roof, loft and floor insulation plus draught-proofing. NIA calls on DECC Ministers to make announcements of their intentions for ECO post 2017 & GDHIF before the summer recess. We are today calling on DECC Ministers to make announcements about their intentions for the Energy Company Obligation (ECO) post 2017 and the future of the Green Deal Home Improvement Fund (GDHIF) before the Summer Recess (21st July 2015). Recent figures published by DECC and Ofgem on ECO showed that the energy companies have already made significant progress towards their targets for ECO2 (April 2015 - end March 2017) and that based on the installation rates in 2014/15 the target could be achieved one year early in Q1 2016. This is reflected in the major slowdown in ECO activity where just 29,000 measures were installed in April 2015, a 2 year low and compares to 51,000 measures in March 2015 and 58,000 in April 2014. In addition, the £450m Green Deal Home Improvement Fund which was designed to compensate for the shortfall in ECO activity following Government cuts to the scheme in 2014 is also on hold whilst decisions are awaited from Minsters. The combined effect of these two factors has resulted in a collapse in insulation activity which is harmful to householders and the industry alike. Finally the annual progress report published by the Committee on Climate Change this week highlighted that all main insulation measures are behind the required trajectory to achieve the UK's carbon reduction targets - in the case of solid wall insulation some 500,000 behind trajectory. The Committee also recommended to Government that urgent decisions were needed on the future of ECO post 2017 to provide some assurance to the supply chain. Therefore we are today calling on DECC Ministers to announce their intentions for the ECO post 2017 and GDHIF before the House of Commons rises for the Summer Recess on 21st July 2015. The NIA welcomes the recent cross party agreement for action on climate change and is urging party leaders to agree support for an ambitious national energy efficiency programme. With over 7m households lacking solid wall insulation, 6m lacking cavity wall insulation and over 7m having inadequate loft insulation the NIA is asking party leaders to build on their recent commitment to tackle climate change by agreeing to make energy efficiency retrofit of the UK housing stock a national infrastructure priority. Supported by additional funding from the Government Infrastructure budget and to pledge to provide support to 6m low income households by 2025. Over the last few weeks we have been contacted by a significant number of Green Deal Assessors and Green Deal Assessor Organisations expressing an interest in joining the NIA and in response we have now opened up membership for GDAs and GDAOs. Affiliate Membership is available at an annual cost of £309 + VAT. Access to information, advice and guidance on Green Deal, GDHIF and the Energy Company Obligation. Opportunity to network and develop relationships with our other members including Green Deal Installers and Greed Deal Providers. Opportunity to raise any issues or concerns you have with the current schemes which we can voice on your behalf with Government , energy companies and other key stakeholders. Attend our local briefing events and Annual Conference/gala dinner. With the cuts to the Energy Company Obligation (ECO) announced by Government last year, an increasing number of Local Authorities and Housing Associations are now unable to secure ECO funding for insulation programmes and are therefore funding these from their own budgets - as a result we are increasingly being contacted by them asking for our help in finding local installers to carry out work on their behalf. In response to these requests the National Insulation Association (NIA) is pleased to announce the introduction of a new service for Local Authorities and Housing Associations looking for insulation companies to work on their projects. They can provide us with details of these projects and we will then issue expressions of interest and tender requests on their behalf to our members through our electronic communication system. This provides the benefit of avoiding the need to contact lots of different companies and is immediate. The NIA is the lead trade body for insulation measures in the UK representing manufacturers and installers of cavity wall, external wall, internal wall, roof and loft insulation and draught proofing and therefore our members can provide multi measure solutions. In addition, NIA members are required to meet our robust membership criteria and adhere to our strict code of professional practice and therefore using our members provides additional reassurance and peace of mind.